Good times never sounded so sweet or conveyed so much ethereal energy as this foot-stompin’, old-time, “down home”-style gem by The Honeysuckle Possums. Filled with break-your-heart beautiful harmonies, their first self-titled CD is a mix of popular traditional and standout original songs, all sung, played and co-produced by five exceptionally talented women. 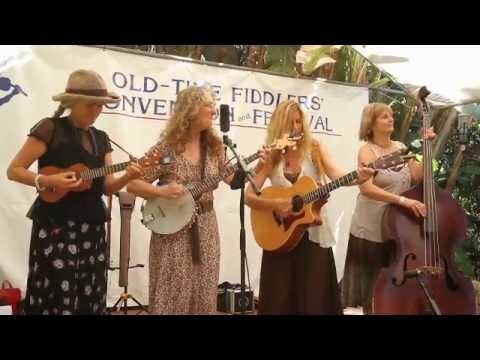 The group consists of three core members – singer-songwriters Rebecca Troon, Susan Marie Reeves and Nicola Gordon (each of whom contribute original songs or co-writes, and take turns singing lead vocals) – along with bassist Lisa Macker and award-winning Flatfoot and Old-Time Buck dancer, Ruth Alpert. 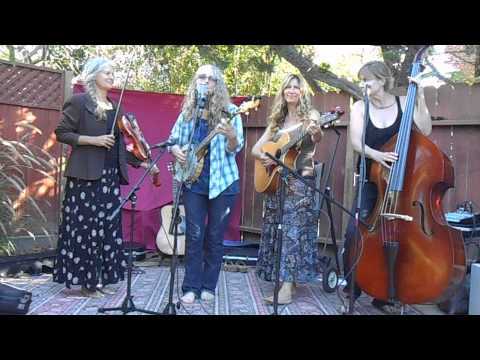 Based in Santa Barbara, California, the five women are the real deal: accomplished multi-instrumentalists who have been playing together for several years now, tightening their sound as they tighten their friendship and amp up the fun. Troon plays banjo and fiddle; Reeves adds a solid rhythm guitar; and Gordon brings a ukulele and fiddle to the mix. Macker occasionally does “double duty” on mandolin or harmony vocals along with her upright bass. And Alpert infuses many of the songs with that inimitable, fast-paced, back porch percussion. But what makes this group really exceptional are their voices. Troon, Reeves and Gordon are all gifted singer-songwriters – each with several albums to her name – and, in my humble opinion (as well as that of legions of other fans! ), they have three of the loveliest voices you could ever wish to hear. That’s a great place to start. But when you put them together, the vocal chemistry is sheer magic. Their three-part harmonies evoke an instant smile. Perhaps equally important in creating this magic is the great warmth, affection and humor they share with each other, and with their co-producer, Robinson Eikenberry. The fun is never far from the surface. And it is absolutely contagious, as those “good vibes” come pouring out of this CD. And the arrangement...with harmonies piling one on top of the other, higher and higher....keep this song non-stop entertaining. It’s followed by another original song by Gordon, a crowd-pleaser/sing-along called I Like You. Written in a light-hearted waltz tempo, the song features Nicola’s deliciously textured voice and always refreshing lyrics. in a voice so silky, sinuous and beguiling, it could put the angels out of business. The next track is one of the most unique originals on the album – a quirky, memorable number called Living in My Car by Rebecca Troon. Set to the plucky rhythm of her banjo, the song is one of those frequent anomalies in country music: a seemingly upbeat, funny song about a really dark subject – in this case, homelessness. 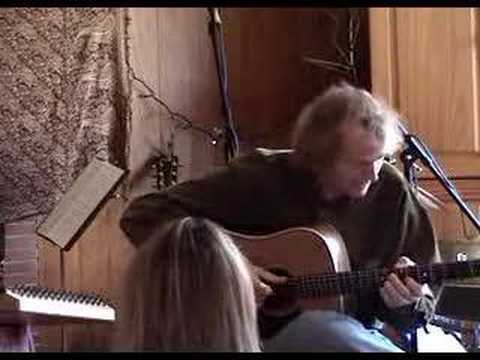 What makes this song so brilliant, I think, is that by writing in the first person and peppering the lyrics with humor and down-to-earth details, Troon invites you into the lifestyle of one of these “forgotten” people, and you quickly realize that they are, in fact, just like you and me. And of course, her irresistible, amazingly modulated lead vocals make this song even more inviting. Be Well in the Valley is another gorgeous melody by Gordon and Reeves – a poignant song of loving and longing for a man who chose another and is now married with children. It has that real old-time, melancholy flavor of undying love...a feeling reminiscent of Patsy Cline. The next three songs are beloved old classics that many will recognize: the rousing barn dance traditional, Waterbound; You are My Sunshine; and Cluck Ol’ Hen (complete with enthusiastic chicken impersonations by the Possums). As always, the Possums put their own special spin on these songs.... especially Reeve’s heartfelt, reflective interpretation of You are My Sunshine. It made me hear the song in a whole different light. The album closes with a loving tribute, You Made Me Laugh - a song written by Troon commemorating the life of “Good Times” Pat Milliken, one of the brightest lights in the Central Coast music community. While his untimely death was mourned deeply in Santa Barbara and beyond, his celebration of life and music remains an almost legendary inspiration. And the memory of his warm, laughing spirit is a fitting way to close this wonderful album. A New York transplant to the tiny town of Carpinteria, CA, Jackie is a freelance writer by profession and a singer-songwriter by passion. Her third album of original Folk/Americana songs was among Top Folk Albums of 2011 on the Folk Music Radio Airplay Charts, and her new newly-released fourth album, Can't Fix Crazy, is among Top Folk Albums of May 2014. Jackie is also an active member in such acoustic music communities as SummerSongs, SongMakers, and FARWest Folk Alliance.